Gallus Golf’s latest marketing solution, LaunchPad, was introduced in the summer of 2018 and is already demonstrating significant success for new partnered clubs needing marketing assistance. This six-week program helps clubs quickly grow their mobile app downloads during their initial app promotion phase, as well as provide marketing strategy and app management to ensure customers stay engaged with clubs long term. On average, partnered clubs using LaunchPad and Gallus marketing services have experienced 3 times the app growth rate than clubs who are not. In addition, these clubs are positioned to have better customer engagement through the communication and loyalty tools available. Given the success of LaunchPad, clubs are gravitating towards Gallus Golf’s full-service marketing solution, BOOST. This service was praised earlier this month by President and CEO of St. Marys Golf & Country Club Matt Staffen as “taking our marketing presence to the next level” and described as having “a full-on marketing team, that is great at what they do and also understands the game of golf”. How BOOST differs from LaunchPad is by providing long-term marketing strategies for golf clubs, while handling the weekly execution of email campaigns, app management, social media, online reputation management, and graphic design. This ongoing marketing partnership with clubs has relieved courses of the headache of handling daily marketing tasks, allowing them to focus on business operations and their customers, all for a considerably smaller investment than hiring a marketing staff to do so at the course. With BOOST’s ongoing marketing efforts, clubs have experienced increased app growth, event participation, membership sales, and overall positive word of mouth by their customers. Learn more about Gallus Golf’s Marketing Solutions. I had the pleasure of speaking with Matt Staffen, President and General Manager of St. Marys Golf & Country Club in Ontario, Canada. In the three years St. Marys has been us, Matt has been a leader in implementing our messaging tools and technology solutions. With the help of BOOST and Matt’s marketing vision, St. Marys Golf & Country Club App has grown their app users from 800 to over 2,500 - in the last season alone! Plus, their Clubhouse Kitchen sales have increased by 28%! Whether your golf club is big, small, private or public, we could all take a page out of Matt’s book on how he has grown his business, and more importantly, built a golf community where his customers feel at home. Molly: Can you tell me what career and life decisions led to you the golf industry and becoming the President and General Manager of one of the top golf clubs in Ontario? Matt: Our family purchased St. Marys Golf & Club Club in the early 90’s when I was about six years old. I started working at the golf course when I was 15 or 16 years old and then went off to university and started working for some really high-end in golf courses up in Muskoka, a well-known tourist region here in Ontario just two hours north of Toronto. I also worked for a big corporate retailer for five years and what drove me back to St. Marys was not just my love for golf, but more of my passion for the marketing side of the industry. So that’s really what led me to my decision to come back to operate the family business and operate St. Marys and grow it to its full potential. Molly: How have you utilized your marketing background to grow your club? Matt: What I really love about this industry and why I love showing up to work every day is the marketing side of it, and what influences a golfer to choose your golf course over the hundreds of other golf courses they have the option to play nowadays. There are 60 golf courses within 45 minutes of us, so that's obviously a big challenge. But we’ve been able to grow our business by taking advantage of the e-marketing side. It started with a lot of emails to our member base, then our Facebook Page, Instagram, and really took off in the last year with the app. We're a mature industry and in order to survive today, you have to grow and be the best. That’s the mentality we take every day and we’ve grown the business that way - whether it’s for our weddings, memberships, or our junior program which all have taken off in the last couple years - revenues have grown 100%. It’s been a whole lot of fun to see our golfing community transpire into what it has become today. Molly: St. Marys is in a competitive golf market, what is your club doing that sets you apart? Matt: First of all, we are continually staying in touch with them. We’ve found that adding the app to our efforts made perfect sense, especially for the younger generation, under forty, who have their phones in front of them all the time, and are not always checking their emails anymore. We also have created a culture and an atmosphere from the moment they walk in the club and play 18 holes and then come back in for food and drinks, to the moment they walk out the door. We want them to they feel like they're at home and a part of a community. That was the second part of it. The third part was reinvestment back into the golf course, back into the property, into our equipment, into our people. For example, the last two years we've undergone a bunker renovation program so we're redoing all of our bunkers and it will be completed next year. We're also buying new golf carts to keep our equipment up to date, our people head of the game, trying to be as progressive as possible, while also growing the revenue side. We know if we only focus on the cost side eventually our competitors will catch up, so the reinvestment was a big initiative for us. It's really about being innovative, reinvesting back in that property, and creating that culture where people want to spend time. Molly: You ran an aggressive campaign for “Free 18 Holes For Downloading The St. Marys App”. Some may wonder why you would potentially give a round away to an existing customer. What was your reasoning behind that and how has it impacted your season? Matt: I felt the need to be aggressive with that offer in order to build our number of users from the 800 range we had been stuck at for the last couple of years. With the help of the BOOST Team, I wanted to go after that market, and attack it quickly to grow our app audience. And we successfully grew our number of users from 800 to 2,500 in a matter of a few months. With the Free 18 Holes offer, we thought it would be easy to give away something for free, but how do you turn that into future sales? We knew the younger generation redeeming this offer would want an experience and beer would be bought on the course and food purchased after their round. That incremental revenue in just doing that offer was good enough for us to justify doing something so aggressive. And now we can reach out to them and try to bring them back with different offers and value plays that will get them interested in spending time here. We’ve used Push Notifications a lot to target that same demographic of forty and under, who are more likely to receive and look at a push notification than an email. Using that Free 18 holes offer and growing our app users was really about the long-term ability to communicate with our customers in a more modern way. We’ve also utilized and pushed onTAP to our customer through push notifications. We want to remind people when they are on the course that they can order food through the app. That was a big thing, as well, because our kitchen sales are up 28% this season. If someone has the app on their phone they will make that decision quicker than looking for a local restaurant. Molly: Third Party Sites and Golf Network Apps, like 18 Birdies, have a large audience of users and courses available. What would be your advice to someone who is on the fence between using a Golf Network App or a branded golf club app? Matt: Third Party Sites has helped grow our revenue, but it's a challenge because if you’re not the cheapest you’re less likely to get the sale and to me, that is not a good long-term play. I want to control as many of the green fee bookings as possible. So if we can do that through our app and website (with dynamic pricing), that will keep the customer coming directly to us. Also, it's a lot easier to communicate our message to them as opposed to competing with every other golf course that’s on those 3rd Party Sites. With the Gallus Golf services, we can bring them here by owning that communication. Molly: It can be very difficult for any business to grow their social media following, but St. Marys app and social media engagement is very strong. How have you grown your online audience? Matt: I think if courses focus on growing your brand and not trying to sell, that is key. We typically don’t go on Facebook and promote an offer. It’s more about having your audience see what the brand brings, what the experience and the culture we are trying to create at St. Marys. We believe they will be attracted to that. Molly: Given the success St. Marys has experienced due to your strong marketing strategy, what suggestions would you have to clubs who are struggling to find time to market their Club App? Matt: The Golf Tournament Module has been big for us and it’s so easy to use. Our Pro Shop Manager, who initially didn’t want to have anything to do with computers, now uses it for everything - even our Glow Golf Night, for scorecards and cart signs. He has really embraced it this year and we’ve even added sponsors to each hole. This allowed us to increase our annual hole sponsor fee by $50, so it’s helped our club on many different levels. Obviously with the BOOST program that was big for me. It made me take the app more seriously and realize its benefits. Why we moved forward with BOOST was because we were content with our 800 followers but it also meant I had to spend a lot of time during the busy season coming up with marketing ideas. When I have our monthly meetings with the BOOST Team it makes it much easier to just talk about those good ideas and put them into action. It work on both sides, but it keeps us organized and forces us to stick to a plan. BOOST is always timely that way. To try to manage the app, in addition to Facebook, and email, it can be a lot for operators, especially in an age when we are trying to manage our labor. To have a full-on marketing team, who are good at what they do and also understand the game of golf can be a challenge to find. Having BOOST on our side gives us a team we can work with, who are quick and ready to take on the things we need to do. To sum it up, the back end module is easy to use, but BOOST will take the app to the next level. Molly: Golf can have the reputation for being a little behind the times when it comes to implementing new technology. Sometimes we hear, “Our club doesn’t need an app because our golfers are older” or “We don’t need Instagram because of X, Y, Z”. If a club was unsure of utilizing new technology to communicate to their golfers, what would you say to them? Matt: There are different ways to target different audiences. The younger generation, who are under forty spend an insane amount of time on their phone, so the way to communicate with them is through the app. We still have great success with our emails, but I’ve noticed in the last couple of years that our email open rates are declining slightly. The older crowd is still responding, but the younger generation is more engaged with a quick one-line message in a push notification. As marketing evolves and that younger generation becomes your customer base, it will be tougher to target them if you don’t have your app available on their phone. Molly: Are there any technologies you’ve seen in other industries, that you would like to see the golf industry to adopt? Matt: Yeah, I think one of the fears with the industry right now, especially with these 3rd parties taking on more and more, is that if you’re not the cheapest, you’re not going to get the customer. Trying to be innovative through marketing, and persuading a customer to come to you, despite what the price is - I think that is a big challenge we are all facing. The hotel and airline industry had experienced this same challenge and figured out the dynamic pricing model, because finding those super cheap deals are not as common today. I believe dynamic pricing is a huge way of the future in our sport and what we do in our industry because it’s figuring out what the price should be in the high and low demand. I think integrating that into the app is a big thing - we’ve done that with our tee sheet. We shouldn’t be trying to be the cheapest, because then it becomes a race to the bottom. It’s more about trying to provide customer value and an experience. If you have your own app, you can connect with the customer that way and offer different things for them to connect to your business. For example, onTAP is a new way to get orders that can be available to someone on the course or a local nearby that wants to pick up food. There are a lot of opportunities out there, you have to figure out who you are targeting and what it is you’re offering - and keeping that customer close to you - instead of the 3rd party sites. Yes, they will always have a place, but if we can control that customer experience, we will all be better off. Marriott’s annual GolfCON will be held August 14th – 16th at the JW Marriott Orlando, Grand Lakes in Orlando, FL. In attendance at GolfCON will be the Marriott Golf Top Executives, Golf Club General Managers, Retail and Business Vendors. Representing Gallus Golf, will be Rob Hoffman, VP of Operations, and Molly Jasco, Marketing Manager. Marriott GolfCON is known as a gathering to celebrate the year’s success, build stronger business relationships, and discuss best practices in all facets of golf club management. Joining the discussion on golf marketing and technology strategies for management organizations will be Rob Hoffman of Gallus Golf, Andy Perez of EZLinks Golf, and Ben Schmidt of GolfNow. All have extensive knowledge on the golf industry as a whole, as well as best practices in implementing technology solutions on a management level. With his twenty years of Marketing and Consulting experience, Hoffman has not only ensured success of their golf club apps, but also contributed to the club revenue growth through his focus on marketing initiatives. “Every year I look forward to this conference to get an opportunity to share with our great colleagues at Marriott Golf some of the current technology trends as well as a peek into the future. This year, in particular, we are gaining on some major advancements, and getting to share this sneak preview with the Marriott Golf team, gaining their insights, will be rewarding for me” says Hoffman of Gallus Golf. One the biggest trends we are seeing in the golf industry right now is the growing popularity of mobile golf apps. Hundreds of golf courses are using them to streamline online booking, shopping, score tracking, and social communities within their member and customer bases. So, why is it so useful for golf courses to make use of a mobile app? The main reason is that mobile apps represent an incredibly powerful marketing platform for selling tee times, pro shop items, and even food & beverage. While it's great that so many golf courses are adopting this new technology, it’s important that golf operators understand how to get maximum value out of the wide range of marketing benefits that apps provide. Mobile apps are proven to have a high rate engagement rate because Americans spend 89% of their time in an app while using their phones. So, if golf courses want to benefit from the mobile revolution they need to have an app. These days, almost no one will use a mobile browser to book their tee time or engage with their club. 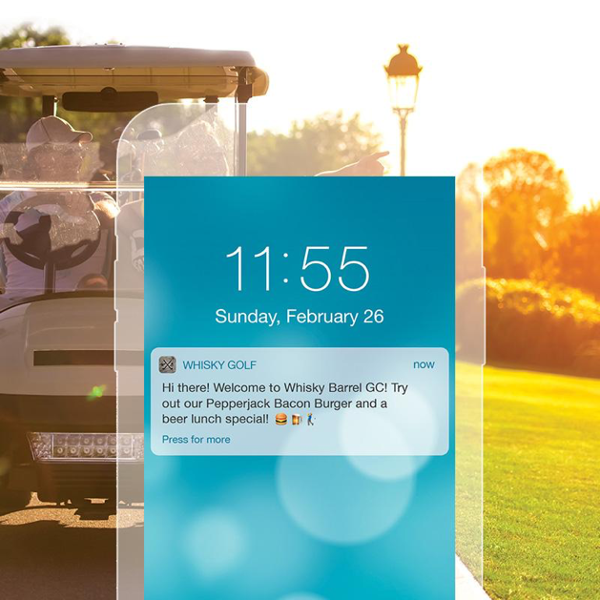 Golf course apps include two powerful marketing tools, push notifications and in-app messages. Push notifications are the little banners an app will send to the front screen of your phone when a news story breaks or you get a text message. In-app messages are messages that are sent to a user directly within an app. Both have a wide variety of uses and will dramatically increase engagement. For this article we collaborated with Alex Lavoie from Chronogolf, the industry leader in cloud-based club management software. What are push notifications and in-app messages useful for? Users of your app who have enabled push notifications represent a captive audience. Whenever your course has a new discount or promotion, you now have access to marketing real estate directly on the front page of your customers’ phones. Best of all, if the promotion is appealing to the app user they can purchase whatever tee time, pro shop item, or restaurant deal you are promoting directly from their phone. A fast and effective way to utilize push notifications, is when you want to get the word out about last minute offers and deals. For example, if a tee sheet is wide open for the following day after 2 pm, send your audience a special twilight rate. The true power of this, versus email for example, is the immediate impact you can have. This message delivery, similar to a text message, grabs the user’s attention, unlike email which often receives a delayed response. Email used to be the most effective channel for promoting an event, today it’s the mobile app. Whenever your course announces a new tournament or event, a well timed push notification can encourage players to RSVP to the event directly from their phones. If desired, mobile apps can also display who is attending, provide menu options, start times, an itinerary and any other event related details. Reduce no shows and late starts by reminding players about their tee times. If the player is going to be late they can reschedule their tee time directly from the app. As well, reminders are helpful for ensuring that attendance at tournaments and events is maximized. Sometimes the weather just won’t cooperate and you have to notify players that their tee time is delayed or that the course is closed. Your customers really appreciate being kept in the loop especially if they get a notification directly to their phone regarding changes in weather, start times, or tee time availability. 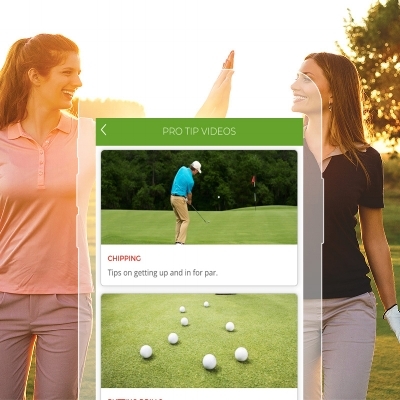 Providing real time course notifications to your audience will increase the value of your app from the golfer perspective, and make it clear you are not only sending promotional messaging. After a tournament send a quick thank you note to all who participated or congratulate player for getting a hole in one or improving their handicap. Occasionally sending these kind of notifications helps personalize your app and will ultimately drive more engagement. In addition, this can be a great opportunity to increase customer retention by adding a discount or offer off their next visit at your club. Perhaps the most powerful aspect of mobile golf apps is their ability to send notifications based on geographic location. Timing is key for reaching users in a meaningful way. It’s impactful when a customer receives a notification showcasing deals in the pro shop and restaurant when they arrive in the parking lot. Research from a recent study shows 36% of people who shop using apps said a mobile location-based push notification influenced an in-store purchase they made. Promote merchandise specials, new food menu items, or events to sign up for in the golf shop. By promoting these offerings to customers who are physically at your location, your chances of closing that sale are much greater. Encourage your customers to raise their voices about their experience at your course. Push notifications are capable of directly asking a customer how they felt about their experience after a round at your golf course. Ask for feedback, pro shop item requests, or restaurant menu ideas. Having a regular check in message is a great way to connect with your customers and build your push notification open rates. Having a weekly or monthly campaign that features “Pro Tip Tuesday”, “Golfer of the Month” or even a link to your regular newsletter will allow you to get greater leverage out of those campaigns that may typically be sent only via email. These can be used for promotional purposes or educational, we suggest making sure there is consistency in the time and day you send these messages out. 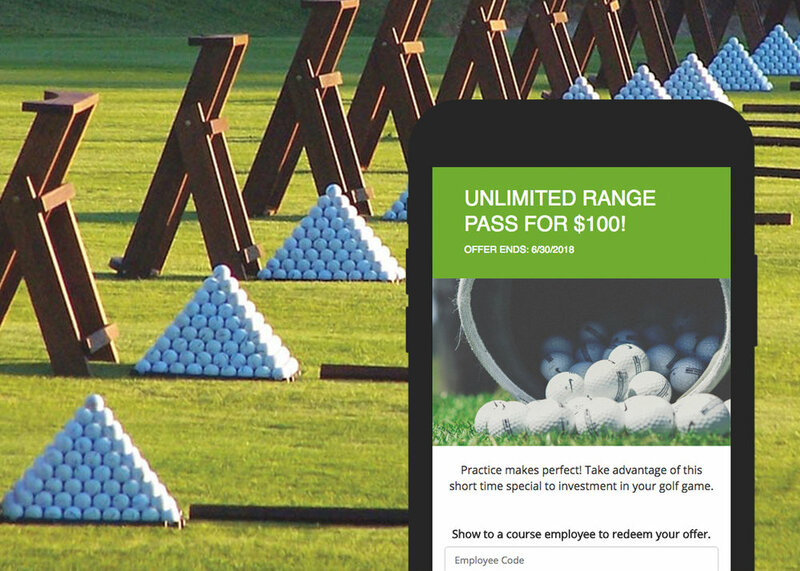 Many mobile golf apps have built in loyalty features for customer rewards and redemption. Because golfers are typically downloading your app for core features like booking tee times, scorecard and golf gps, they are unaware that in-app deals or your loyalty program even exists. 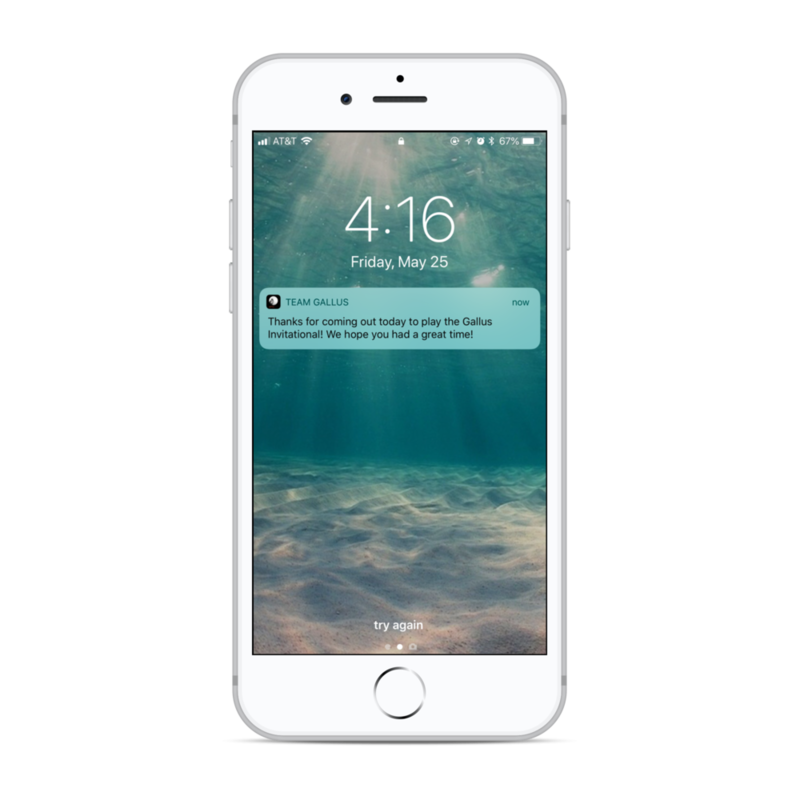 Including loyalty program-related push notifications is another way to balance out your content messaging and highlight additional value your app provides. Introduce your loyalty program to your golfers and use this channel to push a “double points day” or “your rewards will expire soon” to create a sense of urgency. If yourloyalty program is built into your app, you can guide your users directly to that page in your app when they open the message. We’ve filled you in on a number of ways to use push notifications to connect with your customers and promote your business, now learn how to get the most out of your messaging. When To Send: This can depend on the message, but research from Localytics states, Thursdays from 10 am - 1pm generate the best click-rates. Emojis: Not only do emojis add a fun tone to your messages, but a recent study of over 2.6 billion push notifications, showed that emojis drive push notification opens by 85% and conversion by 9% 😃. Add these to your messaging by copying and pasting emojis using the Emoji Keyboard Online. Send Frequency: There is a very strong correlation between notification frequency and greater mobile app retention rates. App users who receive one or more push notifications in their first 90-days have 190% higher average retention rates than those who don’t receive any push notifications. Continuing to send weekly notifications will keep your customers engaged. Message Length: Short and sweet is the way to go. Users are flooded with messages all day long between news notifications, emails, and more, that having a short and concise message with a clear call to action will result in the best open rates. Keywords: Engagement is highest when your message creates a sense of urgency or exclusivity. If a user sees they only have 24 hours to take advantage of a sale or they have early access to an event, they will be more likely to learn more. Segmentation: Use your app to segment your audience by user profile or interests. Now, you can send targeted messaging based specific customer criteria. Users will appreciate the relevant content, which will be reflected in higher open and conversion rates. It’s getting that time of the year when golf season is about to begin and clubs are gearing up to open. You may be asking yourself, what can I do this year to get more value out of my golf club app? How can I grow downloads and provide a better app experience for my golfers? We are going to break down a few of our features and what content makes for an engaging and valuable app to your customers! A great way to engage your audience is to provide a special or promotion. Our offer locker tool makes it easy to create and track one-time deals you want to offer to your customers. For example, you could offer a Free Bucket Of Balls for downloading our app, Spend $75 in our Pro Shop and get $10 on next purchase, or buy four rounds of golf for $150. We suggest updating these deals each month to provide fresh and valuable content in your app! Test different offers to see what is having a positive response and feel free to reuse the following month. Having these deals exclusively in the app will drive downloads and word-of-mouth about your app. What is going on at your Club this season? Events? Leagues? New monthly deals in the offer locker? Keep your users in the know about upcoming events and specials that are being offered. This connection to your customers will keep your Club top of mind to your customers and help you stand out when offering great deals and specials. You can also add a fun element by using emojis, too! In a recent study with over 2.6 push notifications, data showed that emojis drive push notification opens by 85% and conversion by 9% 😃. You can easily copy and paste emojis using the Emoji Keyboard Online. Of course, push notifications don’t have to always be used for promotional purposes. This is a fast and effective tool to get the word out on any course conditions and delays. The frequency of Push Notifications: one push notification a week is expected and not perceived as an interruption. If attempting to gain sign up participation for an event, send the push notification one month prior, then two weeks, and one week until the date of the event. Emojis will help increase conversion - use them! Gallus onTAP is our latest click-to-order food & beverage solution. onTAP allows customers to make orders in your app for pick up and/or delivery. This seamless ordering experience aligns with growing trends in mobile food ordering and delivery. Although food & beverage is the main operation featured in this solution, it’s functionality can be applied to other areas of your business. Now Pro Shop merchandise can be accessible for purchase in the app for golfers looking to grab new gear. If a sleeve of balls or hat is needed mid-round, golfers can initiate that order on their app and either have their order delivered to them on the course or available for pick up at the turn. In the age of the iPhone, it’s never been easier to create great looking videos that showcase your Clubs offerings. Simply, use your smartphone to capture images and video of club events, instruction clinics and camps, and leagues. Import these videos into iMovie or Windows Movie Maker to put any finishing touches on, such as an Introduction title and closing fade out (don’t worry, these video editing applications are free and user-friendly!). Once ready, import to Youtube and place the YouTube URL in your app. These videos should be short, up to about 2 minutes, for optimal engagement. 75% of viewers will tune in for a 1-2 minute video, anything longer you will see that number drop significantly. Whether you are operating an Annual Club Championship or casual weekly league, your golfers can use the app to track their score, as well as see where their competitors are placed. This makes for a fun and interactive experience for players. Using the URL links in the dashboard, you can easily stream these live leaderboards to any TV or monitor at your facility. In summary, there are a number of features and tools that can enhance the golfer experience and provide a connection to your customers. First, make sure all app content is up to date and use visual content to highlight your club’s amenities. Second, consider exclusive deals in your app via the offer locker or loyalty program tool. Communicate these deals and any other Club events with push notifications and geofence notifications in areas your clients frequent. Third, enhance the golf experience and grow your revenue by utilizing our tournament software and onTAP food & beverage solution. If you have questions or need assistance in setting up any of these features - or anything custom you would like to include from great ideas of your own, please reach out to your account manager or support@gallusgolf.com. Entering the Off Season with Relevance! A little bit of a re-tread here, but just as valuable this year as it was last! For so many of our courses, entering Autumn means entering the stretch-run for the year, knowing winter and closed golf courses are right around the corner. For those of you out there who experience the opposite season and are just coming into the prime time of the year, pay attention anyway because May is not that far away for you! You've got some time left before you prep to shut down for the winter. The weather is still great and golfers are still flocking to the course. NOW is the time to begin a season ending full-court press to get your app downloaded to their phones. Make sure every golfer checking in to play knows about the app, have promotional materials posted everywhere, run events like a skins game or any tournament that will drive downloads in bulk by featuring live scoring within the app, run some kind of season end giveaway where the entry form resides only in the app forcing a download to register, and of course feel free to reach out to us for more ideas. The more users you enter the off-season with, the stronger your off-season will be. Positioning your course to be prepped to hit the ground running when the next season begins should be a huge priority all of the time, but more often than not during busy times we get caught up in being so busy we forget to be doing everything we should be, all of the time. Don't let the season escape you without gathering a bunch of Golfer reviews of your course to be able to use as you begin marketing for the next season. In fact, if you know the golfer would be writing a great review, ask him/her to post it on Yelp, Google+, greenskeeper.org, etc. Any time is the right time to be working on your reputation, so don't let the season get by without making significant effort. You work hard all season long to compel golfers to come to your course. Your content runs the gambit from praising your course conditions, to talking about the great events you are hosting, to sharing about holes in one, and so much more. Don't stop in the off-season because golf has stopped. Share a golf joke via push notification. Read about our last tip here of offering sales and discounts during the off-season and create content to share surrounding those. Share golf vacation info from your members---"Congrats to John Doe on his 76 at Florida Golf Course during his golf vacay, bring that game back here in May JD!" Basically, use the app to keep your audience engaged this off-season. After all, their love of the game hasn't waned, the weather just stinks! Your golfers don’t vaporize during the off-season. It’s important to stay in contact with leads and customers throughout the entire year. Consider social media and push notifications your virtual, year-round storefront -- because even if your audience isn't hangin' in the clubhouse, they are certainly phone-in-hand perusing their social media feeds! That means leveraging Push Notifications, Facebook, Twitter, LinkedIn, Pinterest, the whole shebang to stay top of mind year-round. You should be using this real estate to offer special discounts for next year, gather (and publish) reviews and testimonials, run contests and polls, and generate hype for the next season. So, you think I am only going to talk about Push Notifications and a little social media to push out your message during the off-season, huh? Not so! You have a big email database. Use it. You should look to ensure your spot as the #1 golf course that comes to mind when the next season rolls around, and to be in that #1 spot the frequency and reach with which you communicate with your golfers can be increased by branching out to email too. If you don't have one, this would also be a good off-season to begin your E-Newsletter to share with golfers as well. The off-season will be a good time to reflect on all of the fun this season has been, and start to build the hype about next year! Share photos and results from the club championship---start some trash talking about who will put a game together to win next year. Talk about improvements planned for the course for next year. Get freaking excited, would you already?!?! Make this off-season your time to target that one demographic you've been longing to add to your list of clients, or more than one group. Host off-season parties for them at the club getting them excited about the place they have at your club and how you will cater to them next season. Imagine how much better business will be next year if you tackle this group, get the app on their phones this off-season, and begin communicating with them regularly. In fact, if you land one new group like this, build a league or some kind of event for them, they have 100 golfers, and each one plays 10 times at your course next year at $40 each, your efforts just landed you $40,000 in revenue next year that you didn't have this year. So...you thought those shirts and hats would sell out before the end of the season. It's okay, the holidays and birthdays and all kinds of reasons to still buy gifts for golfers are still upon you, even with your greens and fairways covered in snow. Two push notifications a month about sales you are running to close out merchandise at the club will land you more business. Be social about these sales too and put them all over your social media feeds. Start next season with fresh merchandise, after ending this one by making some money! Undoubtedly Rickie Fowler will be wearing something newer and cooler next year, so this winter is the time to get rid of what he's still sporting! Plus, if your website is set up right, you can push these sales to your site and not even have to open your pro shop to sell things, and even make a little money on the shipping to compensate for the discounts if you do it just right.